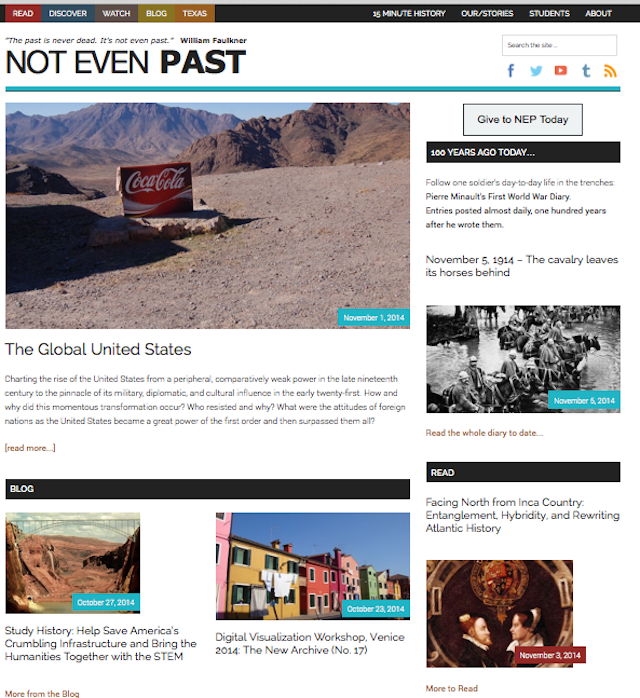 In the past years, the Roy Rosenzweig Center for History and New Media has produced a myriad of digital tools and scholarly reflections on the impact of using digital media and computer technologies to democratize history. For the Center, democratizing history means to incorporate multiple voices, reach diverse audiences, and encourage popular participation in presenting and preserving the past. Daniel J. Cohen and Roy Rosenzweig, both former directors of the Center, offer a pragmatic and well-documented guide about the ways in which historians can “build the digital future of history in the web” or the “History Web.” The book offers a reflection on why historians should build history websites and the related on-the-ground challenges and opportunities of doing so. Digital History begins with a brief history of digital history and the ways historians have translated their work to the web with digital archives, online exhibits, online articles with sets of historical documents, historical fanzines, blogs, educational resources, and multimedia products. The authors contend that becoming familiar with what has already been done on the web, defining the genre of the site you are creating, and thinking about the intended audience are basic steps to get started online. The key questions here are: what communities of people do you want to reach and what are your goals in doing digital history? After assessing the different genres of the History Web, the authors then turn to a very pragmatic discussion of how to start a historical website. In “Getting Started,” the authors highlight the importance of understanding the basic technologies behind the web to be able to match scaled technologies to particular History Web projects. The authors offer basic explanations of the nature of a website—the non-fixed nature of content on the web—the decentralized nature of the Internet, the programming lingua franca of the Internet – HTML — and choices about where to host a website. Each website has a content and purpose, they contend, and an appropriate technology should match each website. They then turn to an overview and assessment of the many computer programs available to make basic websites (such as Dreamweaver and Microsoft’s Front Page) that require varying levels of HTML or other knowledge. Alluding to the potential for interactivity, the authors refer to Flash—an animation software—for creating multimedia narratives combining videos, maps, timelines, photographs and text. Another key issue is a task that historians face day to day: organizing the data. Databases or XML are necessary when one has hundreds or thousands of artifacts or documents to display. A more complete discussion about the possibility of organizing expansive resources using databases or XML is found in the Appendix of the book. The chapter ends with the question of how to fund a digital history project and a reminder of the importance of defining clearly the genre and goals of the project. Not Even Past brings primary sources, book recommendations, and the cutting edge research of the Department of History at UT Austin to the wider public through digital medium. The authors go on to discuss the possibilities for manipulating historical data with electronic tools in order for historians to make findings that were not previously evident in analog sources. In this connection, one of the first steps in a digital project is to efficiently produce digital formats. Here the authors assess the pros (advantages of access) and cons (expensive, information is lost) of digitization, the ways in which a text can be digitized, and the existing digital formats. The chapter also offers information on specific tools to make images digital, how to digitize sound and moving images, and they discuss whether you should do all of the work by yourself. 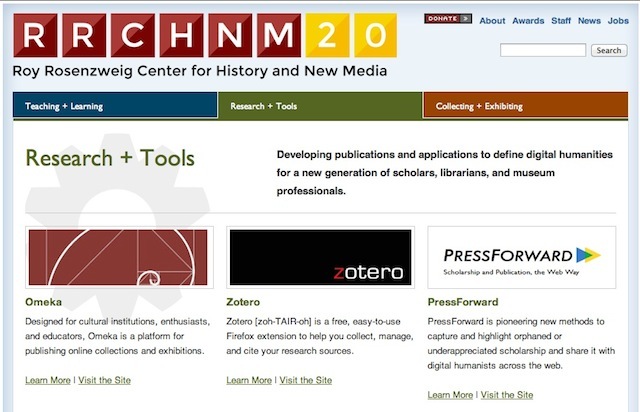 Related to building the repository of digital materials to feed any digital history project is designing a website itself. The authors stress the centrality of designing websites that serve public historical understanding. In “Designing for the History Web,” the authors discuss several design principles that can account for effective online communication. Since presenting content in the web is different from composing paper-based works, the authors stress the need to think about design principles such as contrast, the relationship between features on the page, order, alignment, consistency in color, font, size, and texture. Since the nature of hypertext implies non-linear navigation of contents, every webpage needs a basic navigation tool. Lastly, the authors discuss the site structure, which I believe should be the guiding principle of any web content, even before defining stylistic elements. The information architecture of a website is what allows users to know where to find information in a website. “Building an Audience” is concerned with strategies for attracting an audience to a history website. The chapter discusses the importance of defining an audience, reaching it, marketing strategies, get visitors to comer back, and tracking and assessing the audience using log analysis programs. “Collecting History Online” casts light on the use of the Internet to collect accounts and artifacts from the recent past. The authors argue that the collection of historical documents, images, and personal narratives has the potential to create innovative forms of history in the future. Thousands of historical sources are produced daily on the web. Webpages are ephemeral, newspapers sites change every day, and even many blogs disappear leaving no trace. Gathering material from the web, however, can entail hurdles related to privacy and copyright. “Owning the Past” traces the history of copyright and intellectual property, which the authors call “an ever-evolving set of principles” that raises questions about the rights of producers and consumers on the web. The authors align themselves with the principle of Creative Commons, which allows the distribution of material found online as “a shared storehouse of human creations.” The authors discuss the legal landscape that digital historians should navigate to protect their intellectual property and ensure their compliance with copyright laws. While historians worry about copyright infringements, for-profit organizations such as ProQuest have made massive investments in digitizing the past and selling access to their collections to universities. Questions of unequal access to digital historical materials forefronts a debate on who owns the past and engenders ethical questions around the commercial drive that turns paper-based sources into commodities. This raises issues around the copyright, for example, of twentieth-century materials (almost everything published after 1923 remains covered by copyright), that in the majority of cases only big corporations can afford. 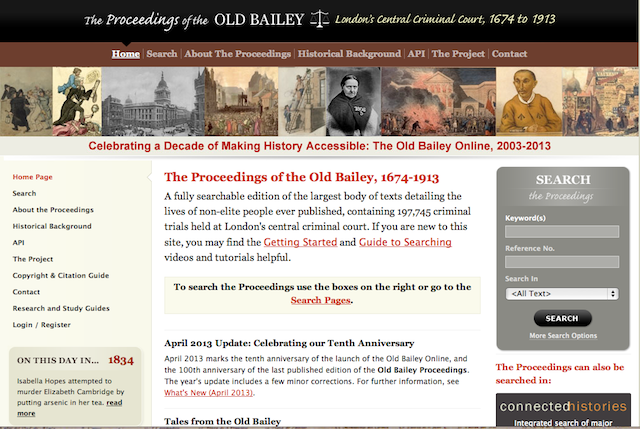 The Old Bailey Proceedings Online makes available a fully searchable, digitised collection of all surviving editions of the Old Bailey Proceedings from 1674 to 1913, and of the Ordinary of Newgate’s Accounts between 1676 and 1772. The final chapter, “Preserving Digital History,” is a meditation about strategies to ensure that digital materials will survive in the future in an electronically unstable environment. Digitization is not preservation, the authors explain, given the loss of information that comes from transforming analog into digital format. A robust reliable storage system is not enough, the authors argue, and the information sciences still have a long way to go towards improving the longevity of digital copies and avoiding the corruption of files. In short, the book offers a comprehensive overview of the perils of contributing to the History Web and ways to manage the obstacles and produce a useful website. Surprisingly, the book does not situate digital history within the broader field of the digital humanities. This issue has been the subject of debate, as it seems that digital humanists have defined the field mostly around digital literary studies leaving digital history outside the defining features of the intersections between computing and the humanities. Lastly, rather than reading the book in a linear way, I recommend using this book as a manual in which to find advice on specific practical issues regarding the creation of a digital history project. Very useful assets of the book are the countless links to online publications and digital history projects. 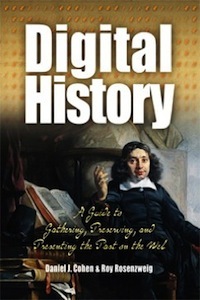 Learning about digital history is partially achieved by reading the book. Navigating through the great number of online digital projects, even those in literary studies, I believe, is the best way to get a sense of the various, creative ways other humanists have chosen to preserve and visualize their research in the web. One question remains: Now that we have a multitude of digital history websites – archives, blogs, data visualizations and collections, how are these digital tools shaping historical research methods? Stay tuned. Daniel J. Cohen and Roy Rosenzweig, Digital History: A Guide to Gathering, Preserving, and Presenting the Past on the Web (Online).